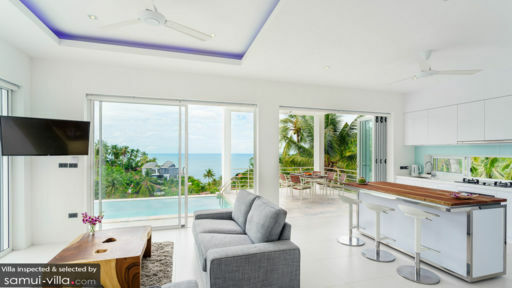 Set in a prime hilltop location in Chaweng, Villa Melo L offers uninterrupted vistas out to its lush jungle surroundings and the ocean. There’s much to see and do in the area, with an array of restaurants and boutiques located just minutes away. 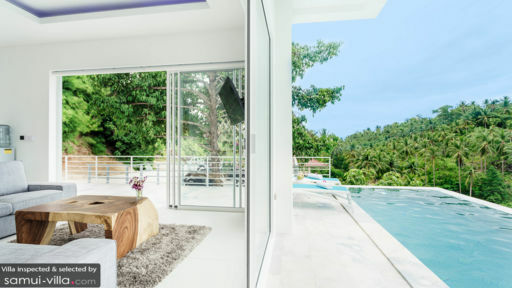 Three bedrooms, sun soaked outdoor spaces and impeccably furnished common areas makes the villa an unforgettable retreat for small travelling parties and families of six. Three bedrooms are spread out over two floors; the first bedroom is located on the ground floor, while the remaining bedrooms are set on the upper level. Amenities common across all three rooms include a capacious balcony, king bed, flat screen TV, ceiling fan, blackout curtains and en suite bathroom. Similar to the common areas, each bedroom is furnished with modern pieces and decked out in soft, soothing hues. The upper floor bedrooms also come fitted with built-in wardrobes and vanities. The highlight at Villa Melo L is its turquoise infinity pool. Set along the edge of the property, the pool looks out an incredible tropical landscape made up of dense forestry. Sink into the refreshing waters of the pool, recline against the sun loungers or sip cocktails while you enjoy a spectacular sunset show in the evening. A covered terrace, complete with a dining set offers a breezy and laid back setting for al fresco meals. The common areas at Villa Melo L are spread out across the first level. Upon stepping in from the parking area, you’ll step into an open plan area featuring an indoor lounge and kitchen. The vibes here are ultra-chic and stylish, thanks to the all-white walls and flooring, neutral colour scheme and contemporary furnishings. Colourful artworks enliven the interior, and ample sunlight streaming in through the glass sliding doors add on to the sense of spaciousness within. Push back the glass doors to keep the interiors cool with tropical breezes, and to have easy access to the pool and al fresco dining area. Guests at Villa Melo L have shared access to a fitness room located within the estate. Villa Melo L offers a full range of housekeeping services to meet all your holiday needs. A personal chef is available to prepare homemade meals for your entire travelling party at additional cost. Massage services, along with car and motorbike rentals are available at request, and your villa manager will readily assist with any other enquiries you may have. An array of local amenities and attractions are located within the vicinity. Take an 18-minute drive out to Chaweng Beach, an attraction known for its picture-perfect white sand shores and bustling nightlife scene. In addition to popular party venues like Bar Solo and Ark Bar, the area is also peppered with restaurants and bars catering to a family-friendly crowd. Some of our favourite hangouts are On Street Bar, Legends Bar, Thong Suk Bar and Restaurant, Khaw Glong Thai Restaurant and Coast Beach Bar & Grill. 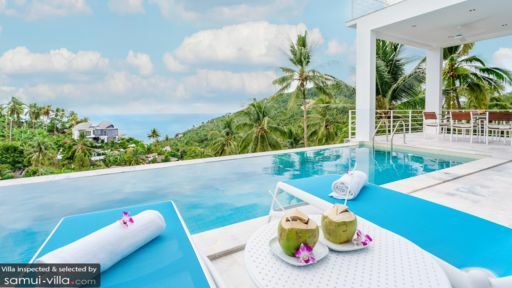 Closer to home are venues like Jungle Club; this well-loved hillside restaurant is just a six-minute drive from your villa. Souvenir shops and beach stalls are dotted all around town, but to experience the lively atmosphere and locals’ way of life, hop on a car for a 10-minute ride to the Chaweng walking street. For day trips, we recommend visiting attractions like the renowned Big Buddha (located a 30-minute drive away), Wat Bang Rak (a 21-minute drive from your villa) and Lad Koh View Point (located a 4-minute drive away).